Rieti, ItalyValerie Adams, Burundi’s Francine Niyonsaba and Svetlana Shkolina grabbed the headlines at the 42nd edition of the Rieti meeting on Sunday (9), the final leg of the IAAF World Challenge. 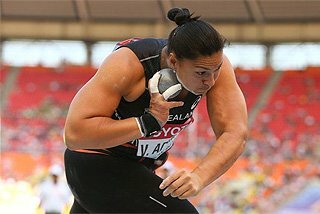 New Zealand’s double Olympic champion and Samsung Diamond League winner Adams capped her impressive season with another great performance in the women’s Shot Put with a new meeting record of 20.77m in the third attempt. The previous record was held by Nataliya Koronenko with 19.83m set in 2006.The Kiwi shot putter produced three more throws over 20 metres - her full series was 19.86-20.37- 20.77-19.79-20.16. "It was an amazing competition," Adams said. "The circle was fast and I enjoyed the atmosphere from the crowd. Rieti is an amazing town and I am really looking forward to coming back next year." 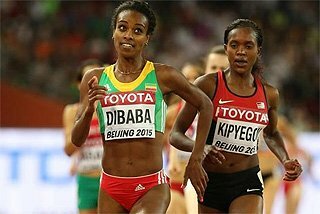 Nineteen-year-old Niyonsaba, seventh at the Olympic Games and African champion in Porto Novo, scored her second win in the women’s 800m clocking a superb 1:57.65 just two days after her great display in the Brussels Samsung Diamond League meeting where she set a new PB of 1:56.59, the third fastest ever time for a junior. As in the Belgian capital Niyonsaba took the scalp on Olympic and World champion Mariya Savinova, who finished a distant second 1:59.16. Kenyan Winny Chebet lowered her PB clocking 1:59.17 for third place. Shkolina had a clean card up to 2.01m clearing all heights in her first attempt before making three unsuccessful attempts at 2.05m. 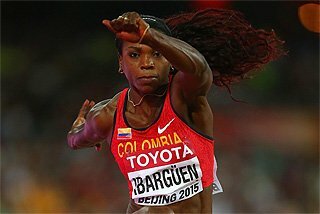 Chicherova cleared 1.85m, 1.89m and 1.93m and 1.97m in her first attempt before failing her three attempts at 2.01m. This year’s surprise Olympic 1500m champion Taoufik Makloufi narrowly missed his 800m PB by 0.03 with 1:43.74. 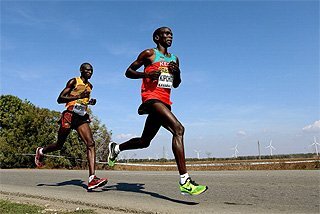 The race was launched by pacemaker Nicholas Kipkoech who went through the first 400 metres in 50.08 before dropping out 100 metres later. Makloufi took the lead at 600 metres and came off the bend in the lead. 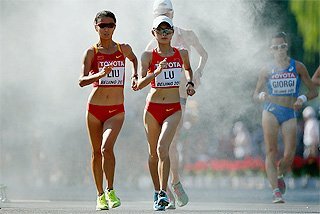 In the final straight the Algerian middle-distance runner had to hold off the desperate sprint by 17-year-old World Junior bronze medallist Edwin Melly Kiplangat but the Algerian managed to save the win by 0.06. Melly smashed his PB from 1:44.32 set in Stockolm to an impressive 1:43.81. Olympic finalist Andrew Osagie won the fight for third place clocking 1:45.06. Kenyan Silas Kiplagat, World silver medallist in Daegu 2011 and Samsung Diamond League winner, continued his great post-Olympic season by scoring his third consecutive win in another sub-3:32 time following his SDL wins in Lausanne and Brussels. 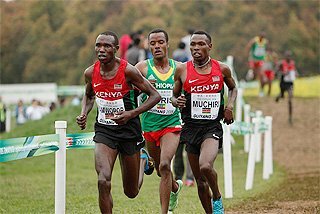 Ismail Kombich paced Kiplagat and Collins Cheboi at 400 metres (55.14) and 800 metres (1:51.26) before dropping out at 1200 (2:50.16). Kiplagat broke away from Cheboi with 300 metres to go and ran an impressive last lap to romp home in 3:31.86. Cheboi finished a distant second in 3:33.97. Italy had something to celebrate for the good performance by 19-year-old Mohamed Abdikhadar who clocked the second fastest junior time in Italy with 3:39.53 which earned him sixth place. Australian Collis Birmingham produced a major surprise by taking the victory in the men’s 3000m in 7:37.77. Birmingham pulled away with 800 metres to go breaking away from the rest of the field with an impressive change of gear and romped home with a lead of 5 seconds over Bobby Curtis who clocked his PB with 7:43.65. Conseslus Kipruto, 3000m Steeplechase World Junior champion, improved his PB over the flat distance with 7:44.09. Double 5000 and 10,000m World champion Vivian Cheruiyot, who won the silver in the 5000 and the bronze in the 10,000m in London, scored another win in a tactical women’s 3000m in 8:49.17 in the final sprint over double world silver medallist Sylvia Kibet (8:49.38). Mary Kuria won the women’s 1500m at a canter in 4:08.76 for her second consecutive victory this week after the Palio della Quercia in Rovereto. Anna Pierce of the U.S. won the battle for second place in 4:11.20 over World silver medallist Hannah England (4:11.50). Franch sprint star Christophe Lemaitre cruised to a winning 10.04 in the men’s 100m edging out former World champion Kim Collins (10.09). Two years ago Lemaitre set his French record clocking 9.97 which he lowered last year to 9.92. French sprint had a mixed day as European silver medallist Jimmy Vicaut committed a false start and received the red card. 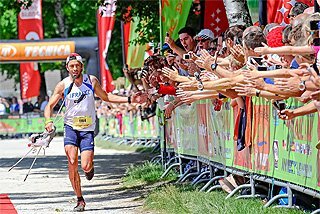 "Before the race I felt pressure," Lemaitre said. "I am sad that Jimmy Vicaut was disqualified because I feel that I would have run faster with him in the race. 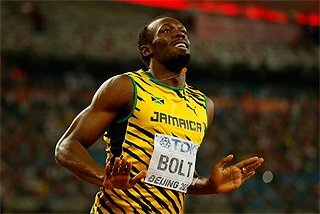 I would have liked to run faster but I equalled my SB set in Rome at the end of May." The IAAF Hammer Throw Challenge reached its conclusion. Both men’s and women’s hammer throw competitions were staged today after the qualifying round held yesterday afternoon. Olympic and European champion Krisztian Pars from Hungary, already first in the Challenge ranking, capped his consistent season with another win with 79.22m. Pars, who produced the best throw in Saturday’s qualifying round with 78.23, would have won with his second and third throws of 77.21m and 77.91m, as Ukraine’s Oleksiy Sokirskiy produced a best throw of 76.43m. Sergey Litvinov from Russia took third place with 75.21m. Former World champion and record holder Anita Wlodarczyk, Olympic silver in London, won the women’s hammer competition with 74.52m which was backed up by a solid series of throws (71.69-74.13-74.52-70.75). For the Polish thrower it was a re-match against Olympic and World champion Tatyana Lysenko who had to settle with second place with 73.52m in the third attempt (with a second best throw of 73.39m in the fourth attempt). Last year’s Panamerican Games champion Omas Cisneros, who clocked 47.99 last year and finished second at the Samsung Diamond League meeting in Zurich, won the meet-opening 400m Hurdles in 48.60. Senegal’s Mamadou Kasse Hahn finished runner-up one second behind in 49.63. Ajoke Odumosu from Nigeria, Olympic finalist in London, soundly beat Olympic champion Natalya Antyukh from Russia who continued her low-key post Olympic campaign finishing a distant second in 55.63. 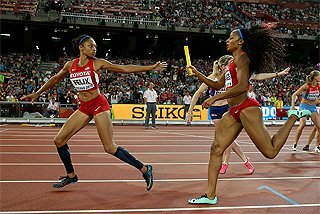 Jamaican Kaliese Spencer, fourth at the Olympic Games in the women’s 400m Hurdles and Samsung Diamond League for the third consecutive year, chose to run the 400m flat and won in 50.64 over Olympic 4x400 relay bronze medallist Christine Day (50.97). Jamaica claimed a clean sweep taking third place with Patricia Hall, who finished third in 52.48. Calvin Smith Jr, the son of former 100m World record holder Calvin Smith, set his SB of 45.12 to beat Sudan’s Rabah Yousif (45.20). Another Jamaican win came in the women’s 100m where Aleen Bailey edged this year’s European champion and Rieti-based Ivet Lalova by 0.03 in 11.21. 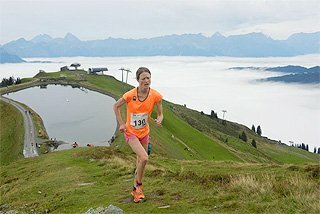 Former World Junior champion Tezzhan Naimova from Bulgaria, finished third in 11.26. 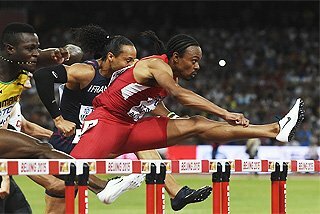 French Olympic finalist Benjamin Compaoré was the only triple jumper to leap over 17 metres with 17.17m after three opening fouls. 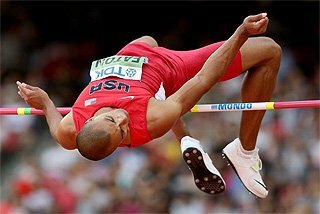 Compoaré would have won the competition with his second best jump of 16.95m, as European bronze medallist Aleksei Tsapik jumped 16.48m. European champion and Olympic bronze medallist Fabrizio Donato from Italy made only an attempt but decided to call it a day because of a minor strain but it is not serious. Anastasya Savchenko from Russia vaulted 4.46m in the first attempt to win easily the women’s Pole Vault over World Junior bronze medallist Roberta Bruni from Italy, who cleared 4.26m before making three attempts at the Italian Junior record height of 4.36m in front of her home fans. Rieti inaugurated a brand-new blue track which will play host to the European Junior Championships next July.